Nothing lasts forever and all the equipment in a plant has associated with it some predefined life expectancy or operational life. Maintenance is the work of keeping the plant and equipment in good condition for operation. It is the action taken to prevent plant and equipment from failing and to repair normal degradation experienced with the operation and to keep it fit for operation. Some organizations do not expend the necessary resources to maintain equipment in proper working order. Instead they wait for equipment failure to occur and then take whatever actions are necessary to repair or replace the equipment. However this fact is to be kept in mind that if there is failure in performing maintenance activities intended by the equipment designer, the life of the operating equipment gets shortened. Adequate maintenance of plant and equipment is necessary to ensure that the plant and equipment is working reliably and effectively. Maintenance can be part of a planned programme or may have to be carried out at short notice after a breakdown. It is carried out to prevent equipment problems and to put fault right. It always involves non-routine activities and can expose those involved and others as well to a range of risks. An effective maintenance programme can result into more reliable plant and equipment. Fewer breakdowns will mean less dangerous contact with machinery is required. It also results into cost benefits because of better productivity and efficiency. Additional hazards can occur when machinery becomes unreliable and develops faults. Maintenance allows these faults to be diagnosed early to manage any risks. However, maintenance needs to be correctly planned and carried out. Unsafe maintenance can cause accidents and serious injuries either during the maintenance or to those using the badly maintained or wrongly maintained/repaired equipment. Maintenance activity consists of taking the decisions and actions regarding the upkeep of the plant and equipment. These are inclusive, but not limited to the following. Actions focused on maintaining and analyzing the data related to plant and equipment health. Planning of adequate and necessary inventory of spare parts, lubricants, fast moving consumables and storage items. This includes standardization of spares and consumables. Actions focused on scheduling, procedures, work/system control and optimization. Performance of routine, preventive, predictive, scheduled and unscheduled actions aimed at preventing equipment failure as well as achieving the goal of increasing efficiency, reliability and safety. There are several maintenance practices which are being followed. These include routine or reactive maintenance, preventive maintenance, predictive maintenance and reliability centered maintenance. Reactive or breakdown maintenance basically consists of running the equipment till it breakdown. No actions are taken or efforts are made to maintain the equipment. Under this approach there is no expenditure on maintenance manpower nor on cost of spares and consumables till there is a breakdown of the equipment. However a large expenditure is needed when there is a breakdown in the equipment both in terms of labour costs and capital costs. This approach can result into secondary equipment or process damage from equipment failure. Also there is longer shutdown is needed for repair which affects the production. Unplanned shutdown of the equipment due to its failure disturbs the production planning. All these affect the supply of the products to the customers. With the reactive maintenance approach, the life of the equipment gets shortened resulting in more frequent replacement. Further since the equipment is run to failure, a large material inventory of repair parts is needed to be maintained. Preventive maintenance is defined as ‘actions performed on a time or machine run based schedule that detect, preclude, or mitigate degradation of a component or equipment with the aim of sustaining or extending its useful life through controlling degradation to an acceptable level’. With preventive maintenance the equipment life is extended and its reliability is increased by simply spending the necessary resources to conduct the maintenance activities intended by the equipment designer. Though the preventive maintenance is not the optimum maintenance method, yet it has got several advantages over that of a purely reactive maintenance method. By performing the preventive maintenance as the equipment designer has envisioned, the equipment life can be extended to the design values. Preventive maintenance helps equipment to run more efficiently. While equipment failures are not prevented by preventive maintenance but the number of failures are decreased because of it. Minimizing of failures means savings in maintenance and capital costs. Preventive maintenance provides flexibility for the adjustment of maintenance periodicity. It results into increased component/equipment life cycle. The estimated cost savings over reactive maintenance method is estimated to be in the range of around 15 %. Predictive maintenance can be defined as ‘measurements that detect the onset of a degradation mechanism, thereby allowing casual stressors to be eliminated or controlled prior to any significant deterioration in the component/equipment physical state’. Measurement results indicate current and future functional capability of the equipment. Basically, predictive maintenance differs from preventive maintenance need on the actual condition of the equipment rather than on some preset schedule. Predictive maintenance is used to define needed maintenance task based on quantified material/equipment condition. This is the fundamental difference between predictive maintenance and the preventive maintenance. The advantages of predictive maintenance are many. A well planned predictive maintenance program can eliminate catastrophic equipment failures since it is based on the preemptive corrective action. The inventory of spares can be reduced and the equipment reliability can be increased. Since there is decrease in the equipment and process down time, operation of the equipment or the process can be optimized. Estimated cost saving from a properly functioning predictive maintenance method can provide a saving of around 10 % over preventive maintenance method and a saving of around 35 % over reactive maintenance method. However predictive maintenance needs expansive diagnostic equipments and personnel handing predictive maintenance need specialized training in these diagnostic equipments. 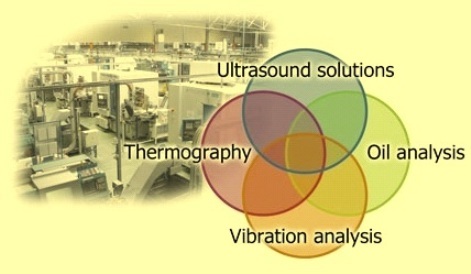 Main predictive maintenance technologies are themography, oil or lubricant analysis, ultrasonic or ultrasound analysis, vibration analysis, motor analysis, and performance trending etc. (Fig 1). Further predictive maintenance to be effective needs firm commitment from the all departments and the management of the organization. This is essential since the savings potential is not readily visible to the management. Reliability centered maintenance (RCM) defined as ‘a process used to determine the maintenance requirements of any physical asset in its operating context’. Basically, RCM methodology deals with some key issues which are not dealt by other maintenance methodology. It recognizes that all equipments in a facility are not of equal importance to either the process or to the facility’s safety. It also recognizes that the equipment design differs and that different equipment will have a higher probability to undergo failures from different degrading mechanisms than others. RCM based maintenance programme recognizes that an organization does not have unlimited financial and personnel resources and that the use of both need to be prioritized and optimized. RCM is a systematic method to evaluate an organization’s equipment and resources so that they mate with each other well and result in a high level reliability and cost effectiveness. RCM relies very much on predictive maintenance but also recognizes that maintenance activities on equipment which are inexpensive and unimportant to plant reliability can be left to a reactive maintenance method approach. Top performing manufacturing organization following RCM approach to maintenance utilizes all the three maintenance methods. The break up includes around 15 – 30 % reactive maintenance, around 25 – 45 % preventive maintenance and around 25 – 45 % predictive maintenance. Organizations which desire to follow RCM methodology are to follow some basic steps which are listed below. Develop a master equipment list identifying the equipment in the organization. Identify effective maintenance tasks or mitigation strategies.